In the spirit of this Thanksgiving holiday, I would like to share the publication of my article PATHWAY TOWARD SOUL: THE FILM JOURNEY as a tribute to the millions of animals around the world who have suffered and died tragically in the name of fashion, ego consciousness and greed, and who continue to suffer and die in silence, their voiceless cries for mercy unheard, at the hands of industry with no regard or respect for life. 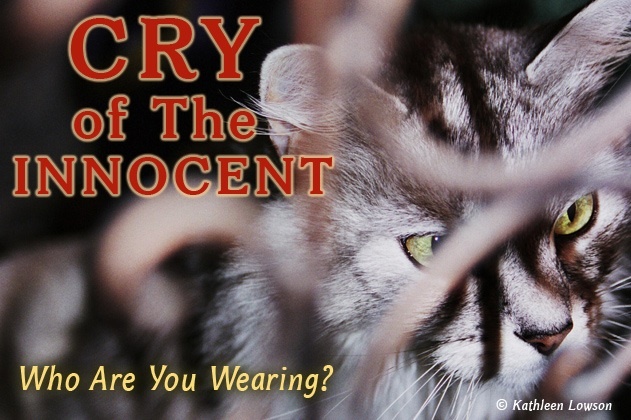 I have focused my efforts on creating a precedent-setting film with the potential to transform the face of fur fashion, save the lives of countless animals around the globe, awaken humanity on our planet, and help heal the “condition of disconnect” in our society. This ambitious vision, at times, seemed unattainable. Like many of us who make great strides to awaken consciousness, we know the fortitude we must muster in our dedication to make the world better. We often experience discouragement and disappointment. But the true spiritual warriors will prevail, and indeed, create transformational change on our planet. In my efforts to manifest the realization of this critical film, the completion of my movie trailer has demonstrated how seemingly insurmountable challenges can be overcome through the power of intention. Since the release of the trailer, I have experienced the profound effect it has had on its viewers, people so moved and deeply affected. The trailer’s impact around the world has elicited a transformative power. I now face the challenge of the next stage of production of this critical film for the animals – for their souls, for our souls, for the soul of the planet – to reveal the spiritual truth of ego consciousness and its consequential effect. Requests are pouring in to view the film, and it is my intention to manifest this important film into realization with the support of the angels of light in this world, who will align with me in the awakening of consciousness. I invite you to unite with me on this journey of evolution on our planet, and take a stand for the voiceless cries of the innocents, who cannot speak for themselves. I watch some videos made by anti-cruelty campaigners, and some I cannot watch, but I always read commentary and sign petitions to help. I think many people block these petition sites because there are too many to cope with and because of the gruesome images, but I truly believe yours is the way to go. We need films like yours to advance anti-cruelty campaigns. Some people think that because they love their own pets unconditionally they dont need to worry about cruelty, love of their own pets is all they can do. But that’s like saying I love my children and I can’t concern myself with cruelty to children. Good luck with your campaign.